The damage caused to the cochlear structures (parts of the inner ears known as the organs of hearing) by high-intensity sound stimulations (loud noises) that have demonstrable negative effects on hearing: "Acoustic trauma is sometimes temporary in the initial stages, but it can result in permanent damage with the continued exposure to loud noises." "To avoid having acoustic trauma, people should wear protective ear plugs or ear-cover protectors to minimize damage to their ears when using loud equipment." "Everyone should be aware of risks of acoustic traumas that are connected with such activities as shooting guns, using chain saws, lawn mowers, driving motorcycles, or when using snowmobiles." "Another way of avoiding acoustic trauma is to refrain from listening to loud music for long periods of time." "Acoustic trauma can occur as a result of an individual's occupation; such as, rock musicians, constructions workers, airline ground crew members; or by using earphones and headphones, etc. with the volume turned up too much." 1. Relating to sounds or the sense of hearing: "The acoustical characteristics of the apartment in the noisy city helped the inhabitants to enjoy a quieter life style." 2. Sounds that are made by musical instruments and voices: "Margaret loves to listen to acoustical folk music." The top of a room that is covered with, or constructed with, material that is designed to control or to absorb sounds: "It was necessary for the gym where they played basketball have an acoustical ceiling because all of the noise caused by the players and the spectators was so irritating everyone." A panel or similar device that is suspended from an auditorium ceiling: "An acoustical cloud was positioned above the orchestra so it could reflect the musical sounds better for the audience." "A music hall had several acoustical clouds suspended from the ceiling; however, the architect forgot to take into consideration that heat from the audience and the performers could send the acoustical clouds spinning around over the heads of the audience until he was able to come up with a solution." The practical applications of the science of sounds: "Acoustical engineering deals with the control of sounds and vibrations; however, it is concerned not just with audible sounds, but also with phenomena that range from barely measurable magnitudes on up to levels capable of causing severe damage." "The normal areas of acoustical engineering include, among others: architectural and musical acoustics, noise and vibration control, underwater acoustics, ultrasonics, communication engineering, shock and vibration engineering, and instrumentation engineering. Architectural and musical acoustics or environments involving sounds. Noise and vibration control or keeping sounds within acceptable limits. Underwater acoustics or sonar engineering oceans. Ultrasonics or ultra-high-frequency sounds and vibrations. Communication engineering or the transmissions of spoken information. Shock and vibration engineering is a part of mechanical and structural engineering. Instrumentation engineering relates to all of the preceding issues; such as, the design and applications of sensors for sounds and vibrations, of sounds and vibration generators, of recording systems, and of data analysis equipment. Harcourt Brace Jovanovich, Publishers; New York; 1992; page 26. Any fabric or composition of material that is designed to reduce sounds or to absorb unwanted noises: "The architect ordered acoustical material for the ceiling of the room from a reputable dealer who specialized in sound systems." Any of various military techniques that involve the use of sound-detection devices to obtain information for intelligence purposes: "The members of the intelligence team of the national army used special equipment for acoustical surveillances in order to detect underground tunnels and shafts which the revolutionaries might be using." Relating to sound or the sense of hearing: "Herman was more acoustically capable of hearing after receiving the hearing aids for his ears." An expert who knows how to deal with the properties of sound: "One occupation of an acoustician is someone who fits hard-of-hearing people with hearing aids." "After her university training, Alice was able to get a job working for a hearing aid company, working as an acoustician who was developing more efficient hearing devices." A motor that responds to sound: "The engineers were developing special acousticomotors for wheel chairs that could be controlled by the voices of handicapped people who were unable to physically maneuver them." An instrument for helping the hearing impaired to hear: "In the local museum, the children from the local school who were visiting, saw a hundred year old acousticon which was shaped like a trumpet which was held close to an ear to enable the user to hear." Relating to the auditory part of the eighth cranial nerve which is concerned with hearing: "Sharon's doctor was hoping to revive her acousticopalpebral so she could overcome her deafness and have some degree of normalcy when people were talking to her." An extreme anxiety of hearing noises in general or specific noises or sounds: Bertha, who suffers from acousticophobia, reacts with fright to unusual or unexpected uproars because she feels as if her environment is completely out of control and she is unable to stop the frightening clamors. In the year 2002, the mayor of New York, Michael Bloomberg, went after the noise makers. He announced a program to tackle the quality-of-life problem most vexing to New York residents: barking dogs, screeching car alarms, music blaring from cars, and drunken bar patrons who share their feelings with everyone on the block at 3 a.m. The initiative, known as "Operation Silent Night", was the city's most aggressive attack on noise since 1994. The operation was set up to focus on twenty-four neighborhoods that had been identified as among the noisiest, based on calls to the city's quality-of-life hot line. Tickets ranging from $5 to $25,000 for businesses with excessive noise complaints were to be issued: arrests, in the most extreme cases, might be made, and cars with blaring alarms were to be towed away. as seen in the International Herald Tribune; October 4, 2002. 1. The science of sound and the phenomena of hearing: Elaine's doctor undertook specialized studies in acoustics in order to work more efficiently with elderly patients who were having hearing difficulties. 2. In physics, the study of sounds, including their productions, transmissions, and general effects: The laboratory for acoustics at the university was outfitted with the latest technology and equipment for analyzing audible and inaudible vibrations. Acoustics often determines how well sounds can be heard in the structural features of a room, a hall, an auditorium, etc. The sum of the qualities, as absence of echo or reverberation, that determine the value of a room or auditorium with respect to distinct hearing: The famous symphony conductor tested the acoustics of the newly build performance hall and announced that the sound was very good. The science of planning and building an enclosure so that sound will be perfectly transmitted to the people who are in it: The newly hired engineer for the architecture firm had her engineering degree in acoustics and seemed the ideal candidate to work on the new performance hall. 4. The part of psychology dealing with hearing: Because his hearing was distorted after his emotional anxiety and inner turmoil, Jason was referred to a psychologist who specialized in medical acoustics. © ALL rights are reserved. 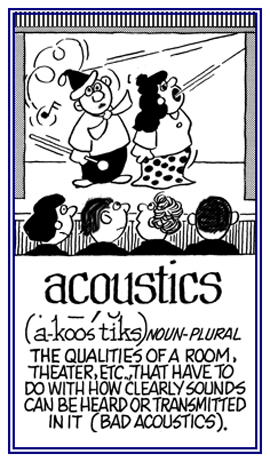 Here is a special article about acoustics. Showing page 3 out of 8 pages of 114 main-word entries or main-word-entry groups.